Inexpensive Valentine Gifts for Him - Home. Made. Interest. Find the perfect Inexpensive Valentine Gifts for Him on a budget. All of these Valentine’s Day gifts for him are $20 or less. Note: This post contains affiliate links. That means if you click on a link and make a purchase we may receive a small commission. I can’t guarantee that the prices won’t change during or after the publishing of this post and are hereby released of any price matching guarantees or liability. Thank you! Valentine’s Day will be here before you know it and whether the gift is for your husband, boyfriend, son or father, finding the perfect present to say “I love you” is always fun. 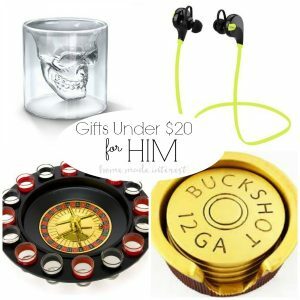 I’ve rounded up some inexpensive Valentine’s day gifts, all under $20, that your guy is gonna love. If you want to spend a little more here are a few more gift ideas for every type of guy. Buckshot Shotgun Shell 4pc Coaster Set– These coasters are super manly! Perfect for a man cave or bachelor pad. Silicone Wedding Bands– I love this gift idea for Valentine’s or an anniversary. If your man has a job where he can’t wear a wedding band, or he’s a gym rat, and it is painful to wear a wedding band while he lifts weights, this silicone wedding band is the perfect solution! Wallet Ninja 18-in-1 Multi-Purpose Credit Card Size Pocket Tool– I keep seeing these everywhere and they seem pretty handy. I might have to get one for myself too! Wireless Bluetooth 3.0 Waterproof Outdoor & Shower Speaker– Loving this gift idea. It is good for all ages. Bet all of the teenagers and college students would enjoy this one. Philips Norelco Multigroom 3100, All-in-One Trimmer with 5 attachments– The beard craze is here to stay so help your guy keep it neat and tidy with this All-in-One Trimmer. “I’ll Get My Tool Box” Duct tape T-shirt– This shirt would be so appropriate in my house! Gamer T-shirt– If you’re like me and you have a husband who loves gaming I know you’ll get this :). Bluetooth 4.1 Wireless Sport Headphones– These are sweat proof! i know my husband would love these when he’s cutting the grass or at the gym. Universal Air Vent Magnetic Car Mount Holder– My husband has one of these in his car and he uses it every day. I’m thinking I kinda need one too! Xbox Live 3 Month Gold Card– It’s like a gamer’s gas card. They have these for PS4 also. Best Sports Water Bottle– Finally a stylish yet manly water bottle. Easy to open the bottle with just one-click. Shock proof, Water Proof, Anti-dust Cell Phone Case– Keep those expensive cell phones safe with this military grade phone cover. Flashlight Beanie– This beanie is perfect for hunting, camping, jogging, auto repair. It’s the handymans beanie! Men Coloring Book– Adult coloring is the latest craze! I’m sure the male artist in your life doesn’t want to color flowers & butterflies. Give him something masculine to color! Golf Bag Cooler– Can’t leave out the golfers. How cute is this cooler, it looks like a mini golf bag! Multi-purpose Microfiber Fast Drying Travel Gym Towels– Great for wiping down gym equipment. It dries 3 times faster than traditional towels. Don’t worry about running out of time, with Amazon Prime, it’s free 2 day shipping. I have found several items that are free 1 day shipping! I literally never have to go into a crowded mall or store again. Be warned, once you go Prime, you will never go back to anything else! Keep this post handy, Father’s Day is right around the corner!